Our award winning 2017 Sauvignon Blanc is sourced from the Rutherford Grade in the Napa Valley. Although light in color, it is big on flavor! Deliciously crisp with aromas of citrus, this lively Sauvignon Blanc awakens the palate with flavors of grapefruit, passion fruit, lemon and lime. This is a food friendly wine that can accompany a vast range of foods. Brilliant! Fermented in Stainless, aged in 20% new French oak 8 months. 14.2% alc. Only 50 cases made. Our Rosé wine begins with premium Cabernet fruit from Belles Filles Vineyard in the Coombsville AVA of the Napa Valley. It is then processed by “pigeage”, or grape stomping, as once used in maceration. Only 50 cases of this light, crisp Rosé is produced. Conjurs up the image of an old “I Love Lucy” episode…..Heavenly! Fermented in Stainless, aged in neutral oak barrels for 8 months. 13.3% alc. 50 cases made. Our amazing award winning red blend made by winemaker Jason Moore. Incredible! 53% Cabernet Sauvignon Estate Grown, 43% Cab Franc, 4% Napa Valley Syrah. Fermented in 50% new French oak & 50% 1yr. French oak. 14.5% alc. 45 cases made. Our Estate Grown, 100% Cabernet Sauvignon. Barrel fermented and aged in 50% new French oak & 50% 1yr. French oak for 22 months. 2014 San Francisco Wine Competition Silver Medal Winner. Fabulous! 14.2% acl. 189 cases made. The beautifully intense ruby color is concentrated from the center of the glass nearly to the edge. The aromas range from tart berries to herbs to black pepper. Flavors are well integrated with notes of black cherry, plum, currants, black tea, espresso, clove and black pepper. The tannins are softening due to age and the finish is long with hints of cola and dark chocolate. A 2016 Silver medal award winner at the NYFL Int’l Wine Competition. Aged 24 mo. in 30% new French oak, 70% 1yr French oak. 13.5% alc. 196 cases made. Enjoy a Magnum of our award winning 2012 Cabernet Sauvignon! Perfect for taking to that large group dinner… or simply enjoying at your own! Your Magnum comes with a hand applied wax seal/capsule instead of a tin capsule (not indicated in photo). Just released… Impressive! Only 6 Magnums available. 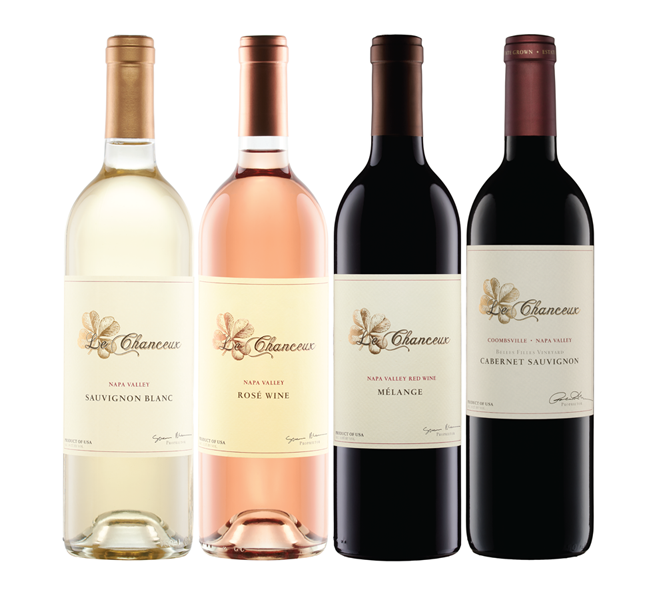 If you love Le Chanceux Cabernet and haven’t had a chance to try our other award winning varietals, 2017 Sauvignon Blanc, 2017 Rose & 2015 Melange (along with one bottle of 2009 Cabernet Sauvignon)….here is your chance to try all in one shipment! One bottle each of current releases will be shipped to you or the wine lover on your list. Let us know and we are happy to wrap each bottle in Napa Valley tissue and enclose a gift card.